The term Rally Road is a local corruption of Rail Road or, as we would normally call it today, a tramway. This was constructed in the mid 1830s from Bridge Quarry, high on the west side of Kerridge Hill, down to the then recently built Macclesfield Canal (1831), where the dry dock and wharf are today. While the route of the entire tramway is easily seen today, there is not a single artifact remaining visible. It is also regrettable that we have never seen a picture of the tramway in operation. However, we can still deduce plenty about its layout and operation from the 1871 OS 25 inch map. A very short section of track was discovered under the grass near the dock and from this it was determined that the gauge was 3′ 6″ and that the rails were in wrought iron. 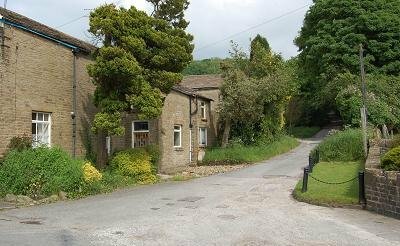 See the page on Kerridge Wharf and Stone Saw Mill. The first 100 yards or so of track was laid in the mouth (gank) of what was then known as Victoria quarry. From just above Windmill Lane the next 100 yards is very steep, an incline, and wagons were lifted and lowered on a cable or rope. A steam engine was located at the top with a large winding drum to hold the cable. Victoria Bridge (left), on Windmill Lane, was built to carry the road over the tramway incline and carries a date stone for May 24 1836. There were two sets of tracks, one for loaded wagons being lowered, the other for empty wagons rising and providing some counterbalance to the descending wagons. The two tracks would have continued down what is today the driveway to Endon Hall and Endon House. The slope here is much less than the incline and horses would have been used to hold back the loaded wagons and draw up the empties. Just before crossing Oak Lane the two tracks became one for the journey to the canal. Once the line crossed Oak Lane the gradient became easier all the way to the canal. The picture (from Bollington Civic Society’s collection, which can be seen at the Discovery Centre ) shows the Rally Road where it crosses Oak Lane – the war memorial stands on the right of the scene today (lower picture). 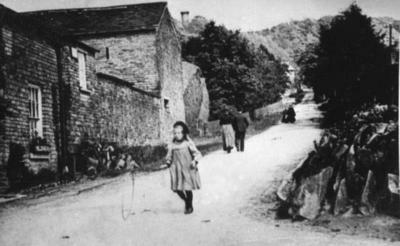 The little girl is bowling her hoop along the road with a short stick, a very popular toy around 1910. Note the absence of rails at that date. 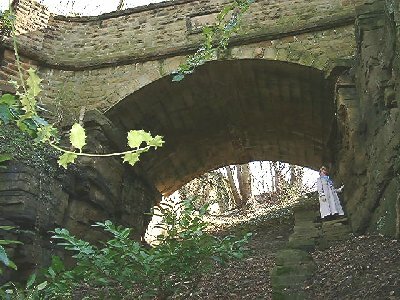 I recall seeing, in the late 1970s, the last of the stone blocks on which the rails were laid, close to the entrance to Endon Hall. The picture shows a short row of these blocks, each with two holes into which the wooden pegs would be driven in order to hold the rails down. There would be another parallel row 3ft 6in away for the other rail. However, these have disappeared under road making materials. 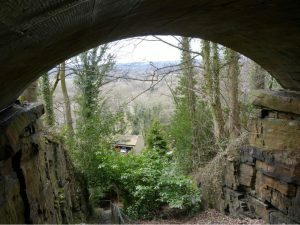 An example of the track has been unearthed at Kerridge Wharf (dry dock) and it was very similar to that which can be seen today at Bugsworth basins , at Buxworth near Whaley Bridge. This was laid out in the late 1790s, while the Clayton track would have been laid around 1836. The Rally Road is known to have been out of use by about 1870.